Danniella Westbrook has revealed she is battling womb cancer. The 44-year-old actress admitted she has been terrified by the thought of dying, and has been thinking about her late friend Jade Goody - who died of cervical cancer in 2009. The former EastEnders actress is set to have a hysterectomy in three weeks time as she battles the disease. Speaking to The Mirror, she explained: 'I've always said I am not scared of dying. But when the doctor said, "You have cancer", straight away my thoughts turned to Jade and that I don't want to die.Jade died in 2009, aged 27, after a short battle with cervical cancer that promoted a surge in women having cervical screenings. Danniella, who has two children, added: 'Getting this diagnosis has made me realise I don't want to die. I want to live and sort out my health. The star, whose mother also battled the disease and is now cancer-free, revealed that doctors initially misdiagnosed her illness after finding a tangerine-sized clot in her womb, mistakenly believing she was pregnant. 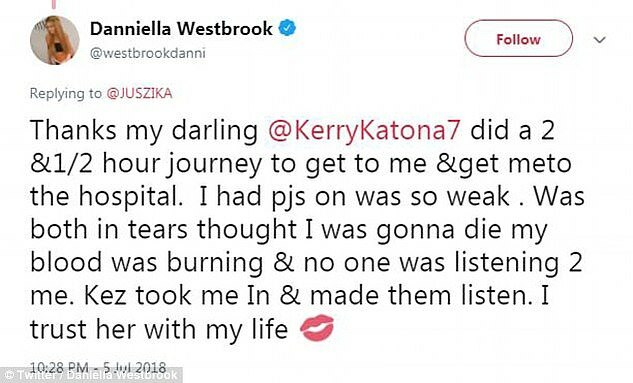 After collapsing in the UK, Danniella was rushed to the hospital by her best friend Kerry Katona, but didn't receive the cancer diagnosis until she had returned home to Spain. In July, Danniella took to Twitter to reveal that Kerry had come to her rescue as her 'blood was burning'. The former Celebrity Big Brother star said at the time that she was being treated for two blood infections, which she claimed were a result of dental implants that she had during the filming of Celebrity Botched Up Bodies. 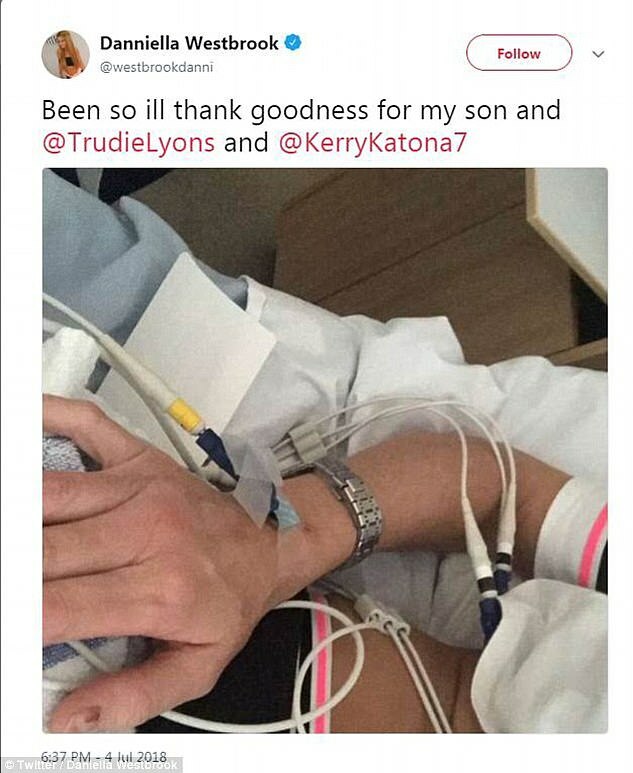 She wrote: 'Thanks my darling @kerrykatona did a 2 &1/2 hour journey to get to me &get meto the hospital. I had pjs on was so weak. 'Was both in tears thought I was gonna die my blood was burning & no one was listening 2 me. Kez took me In & made them listen. I trust her with my life'.Explaining why she posted about the ordeal, the former EastEnder's star said she wanted to be clear about why she was in hospital. 'Thank you all 4 ur kindness,I tweeted b4 people who took pictures of me being brought in sold them & false allegations were made. 'I had 2 blood infections &wrong medication. I just wish @BotchedTV @UnitedSmileCtrs would take responsibility 4 this & put it right'. 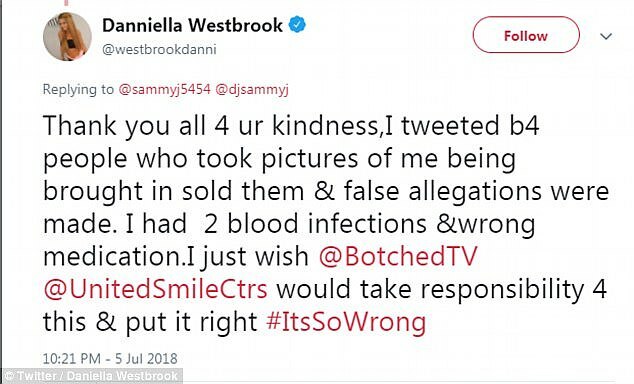 In November 2016, it was reported that Danniella was suing the makers of Celebrity Botched Up Bodies, with the star claiming dental implants she had fitted on the show left her with blood poisoning. Last month, Danniella took to Twitter to confess she had made 'some bad choices' as a result of discovering 'bad news' about her health, later confirming that she began using cocaine again after learning of her diagnoses. 'I hate it & I hate myself after but tbh it’s a illness that twists ur soul. But it’s 1 I battle and won’t let get the better of me', she continued. As a young actress in the spotlight, Danniella famously snorted so much cocaine that she damaged her nasal septum in 2001, leading her to have restorative surgery. She had been off drugs for more than a decade but first turned to them once again thanks to a turbulent relationship with 25-year-old cage fighter Tom Richards.She admitted it was difficult having to deal with her problems in the media spotlight, especially as she has met people who have sold stories about her for their own financial gain. Speaking on This Morning in 2016, Danniella admitted: 'Myself and my kids have been through a tough time with my ex partner... I have made a lot of mistakes. I relapsed because I wanted to after I was clean for 13 years. 'We all battle with our demons but mine are in the public eye,' she concluded.